Anxiety is a psychological disorder that is more than just stress and worrying. Although the symptoms are similar to when one is stressed or worried, people with anxiety may be unable to stop worrying about a situation that, to others, should not be so concerning. There are many different forms of anxiety that can occur at many different levels and varies from person to person. Anxiety can cause restlessness, fatigue, elevated heart rate and lack of concentration. These symptoms teamed together can have a negative impact on one’s ability to function well within society. Anxiety disorders can come in many different forms such as generalized anxiety, social anxiety, panic disorder, phobias and obsessive compulsive disorder. These following tips are useful for the general symptoms of anxiety that may arise when placed in an unknown or uncomfortable situation. Learning to take deep breathes when becoming anxious can work very well to slow down the occurrence of some of the other symptoms that arise with anxiety such as light-headedness, confusion and a rapid heartbeat. Slowing down your heartbeat can begin to de-clutter your mind. This tip tends to be more successful if the music you’re listening to is soothing and calming, such as jazz or classical. Although soothing music is recommended, it can be generalized to music you really enjoy. Listening to music that you like can lift your mood and almost distract from the physical symptoms and from over thinking and exasperating your anxiety. Taking the time to think of things that make you happy or calm can help greatly in distracting your mind from the things bothering it. It can slow down your overthinking to give you the opportunity to calm down. Saying positive things to yourself may sound silly, but it can help to calm yourself when anxiety arises. Telling yourself that something is not a threat and is not scary helps retrain the perspective to the person or thing making you anxious. Whether or not you believe it to begin with, you can be surprised with how powerful saying positive things to yourself can be for your attitude. By doing this you are stopping your negative thoughts that perpetuate the anxiety and replacing them with more calming and happy thoughts. Sometimes anxiety can be the build-up of stressors within your life and often the best way to relieve that anxiety is by simply telling someone about it. Talking things through with someone you feel comfortable with and supported by can make a significant difference. Talking to a friend or family member can help to put things into perspective. The benefits of physical activity can go beyond the body and benefit the mind as well. Exercise reduces fatigue and improves alertness, concentration and overall cognitive functioning. Exercising releases endorphins within your body that can positively affect the mood and outlook, relieving you of stress. Physical activity can take your mind off things and give you a positive and productive way to manage and distract you from your anxiety provoking thoughts. Being able to acknowledge when you are becoming more anxious can assist in being able to prevent it in the future. Writing down the signs and feelings that occur when you become nervous can be beneficial as well. Taking the time to think about what your symptoms are can give you the opportunity to have a better understanding of them. If you have the ability to recognise and analyse your symptoms you can work towards finding a resolution. When you begin to feel the symptoms and signs of your anxiety, it is good practice to try your best to prevent them from getting any worse. Once anxiety has turned into a mild panic, it is quite difficult to calm down. Taking steps to calm yourself before it escalates, through breathing, positive self-talk, listening to music, calming visualisations and talking to someone you can learn to manage your anxiety before it becomes too much to handle. A lot of anxiety stems from concerns and worry about the future and what may or may not occur. This worry about what could go wrong can inadvertently enhance anxiety. Taking a step back and trying to view the stressor as something in the present, makes it manageable. It is hard to fix something that isn’t happening now or may not happen at all. Breaking it into the present can allow you the ability to take steps towards the worry without having it become something too overwhelming. Thank you for taking the time to read this. We hope you have gained some insight into managing anxious feelings. 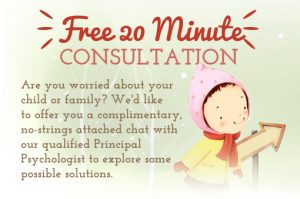 As a gesture of our gratitude, we would like to offer you a complimentary chat with our Principal Psychologist, to assist you in exploring some more options in managing anxiety and stress.